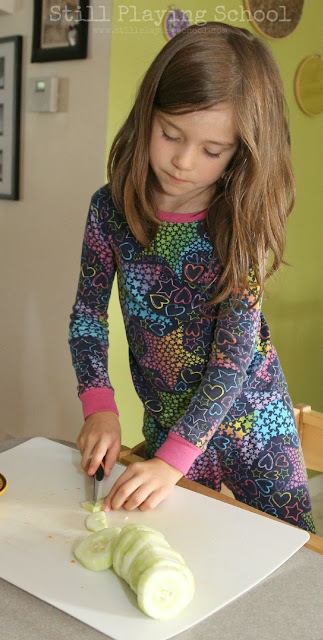 Sometimes our cooking with kids ideas are so simple I almost feel guilty calling them recipes. 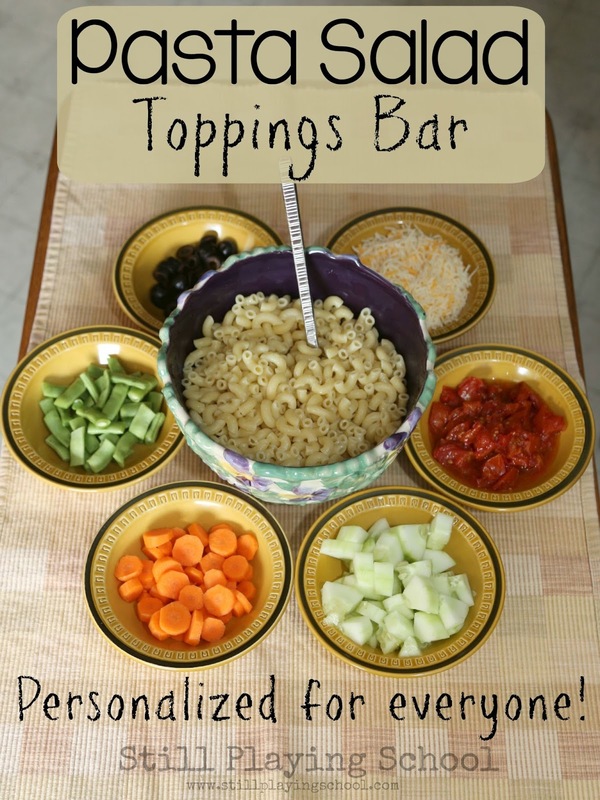 This one is more of an concept since each family member personalizes their own pasta salad at our make your own pasta salad toppings bar! A bit of prep and dinner is ridiculously simple. 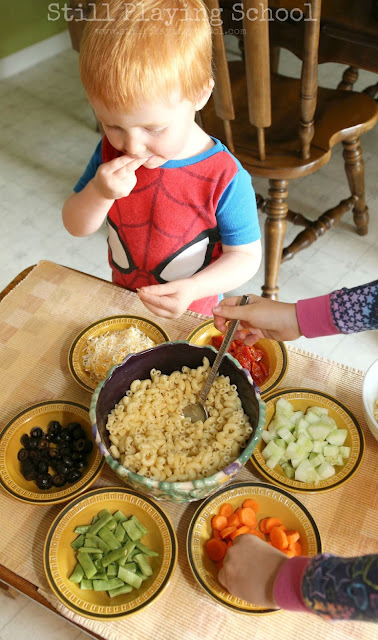 Kids love mixing their own choices in so this was a huge hit with our whole family! 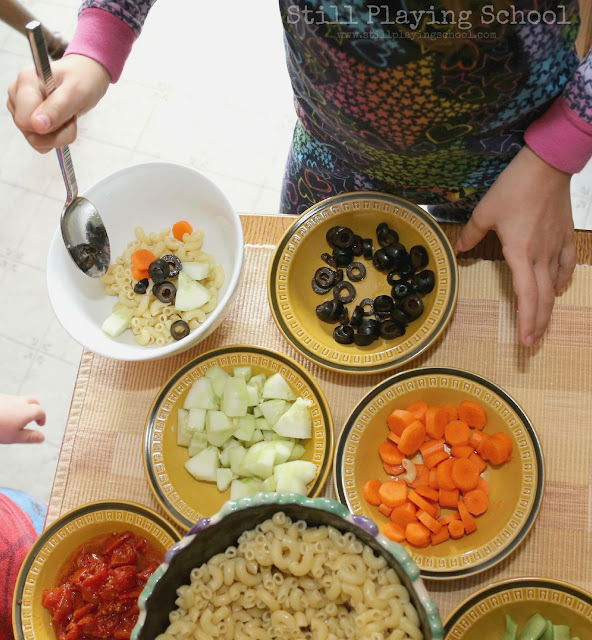 This dinner idea came about because E loves black olives and I don't. 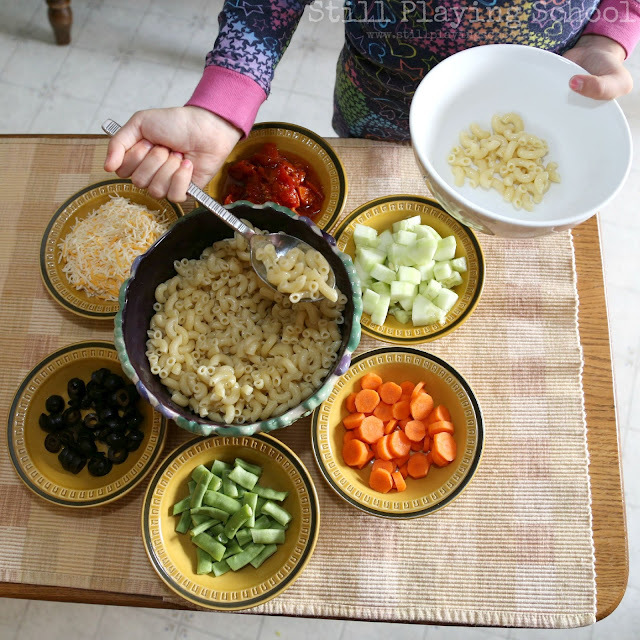 This week's Cooking with Kids ingredient is olives so you'll see how that comes in to this recipe soon. 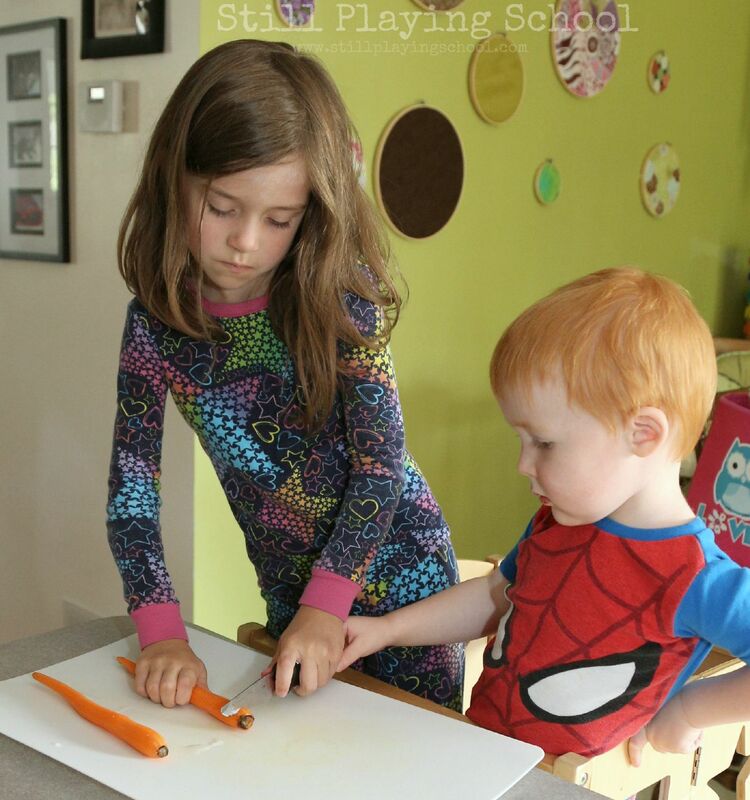 It's inevitable that our kids will eat with more enthusiasm when they help me cook the meal! 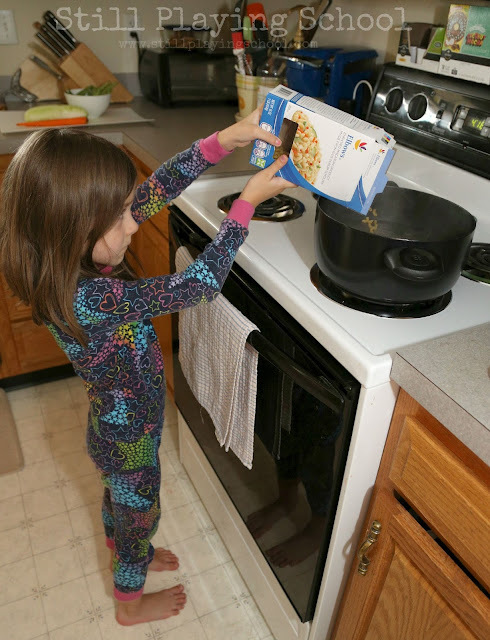 Our preschooler is especially proud to be trusted to add pasta to boiling water (under close supervision) as giving her responsibilities is a sure way to win her over! And yes, we're cooking dinner in our pajamas at 4 pm. Quiet, you! While the macaroni was cooking, she helped me prep the veggies for the pasta salad. I love the versatility here as it really is a great way to clean out your fridge and/or pantry! You can add almost any veggies, cooked or raw, meats, and cheeses that your family loves! She's using our absolute favorite kid safe knife here! I love how toddler D is assisting! She cut up the carrots and cucumbers. Our toppings included roasted tomatoes, cucumbers, carrots, green beans, black olives (E's favorite! ), and shredded cheese. I tossed the cooked, strained, and rinsed pasta in olive oil to prevent it from sticking. Each person can serve themselves based on their personal preferences. We've done taco bars and baked potato bars like this before too and they are always a big favorite! Here is D sneaking some shredded cheese! We didn't dress our macaroni salad with anything besides the olive oil since the roasted tomatoes were seasoned and the olives are salty. 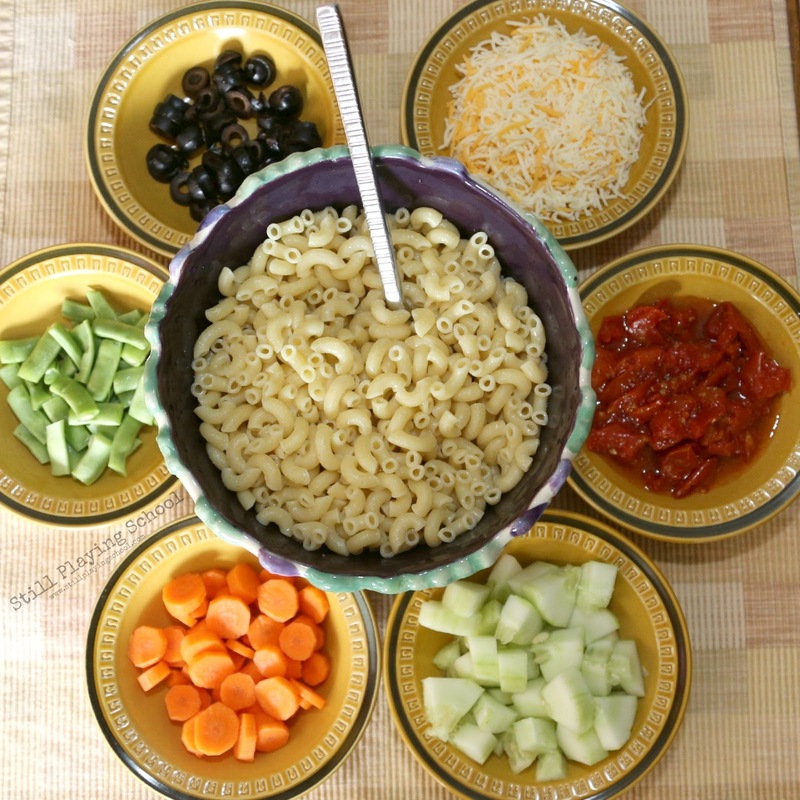 If you like, you could offer a variety of salad dressings or just add a bit of vinegar and spices to the macaroni along with the olive oil. Now that we've tried this out I keep thinking of more options to add. Hard boiled eggs, onion, basil, pickled peppers...what is one person's favorite someone else might not care for and we're teaching the kids to respect these differences in taste! What do you like in your pasta salad? This sounds like an awesome dinner option for busy days. My kids are huge fans of black olives, too! Love that this is something the kids can do on their own. Looks yummy too!